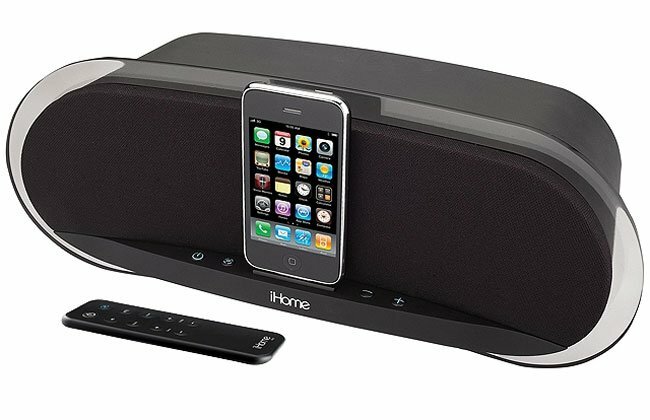 iHome has one of the largest lines of docks for the Apple line of devices on the market. The company has pulled the wraps off a new iPod/iPhone dock called the iP3. The new dock promises some impressive sound thanks to its large 50W class D amplifier. The dock also has a pair of 3.5″ coaxial neodymium speakers. The sound is processed by Bongiovi Acoustics DPS technology to give the dock impressive sound quality. The dock can charge the iPhone and any dockable iPod while it plays the tracks form the media player. Other features include an adjustable EQ for customizing the sound, AV output for connecting iPhone and iPod to a TV, and a line-in jack or connecting non-dockable players. The iP3 ships with a universal 100 to 240V power adapter and has a modern design with a clear acrylic front for style. The dock measures 14.81″ x 5.71″ x 6.23″ and can dock any dockable iPod. The system also ships with a wireless remote. The iP3 is available right now for $199.99.